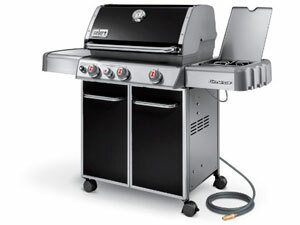 This grill is mostly pre-assembled in the box, and comes complete with a step-by-step instruction manual, manufacturer’s scheduled maintenance guide, and recipe book. On the whole, customers found it very easy to set up, some people reported that it took only forty-five minutes from opening the box to lighting their first flame. However, some people struggled, and complained that the instruction manual wasn’t easy to follow and that the unit should have been easier to put together than the thirty-three steps that the instruction manual required. Overall, people liked the hideaway area for the propane tank and connecting hoses, but some people struggled with attaching the hoses and weren’t really sure what the included wrench was there for. The door hinges are robust and close cleanly with now lip, and also hide the base of the firebox and grease tray. Another positive feature are the locking wheels, which people have commented make the whole unit feel safer than if it was mounted on all moving casters, and customers also liked the two foldable side trays and their function as additional food preparation areas. Most people were impressed with the cooking space that the 637 square-inch cooking surface provided. Some people did not feel that this was an adequate cooking space. Those people also criticized the grill’s rotisserie by saying that there wasn’t enough clearance between the rotisserie bar and the cooking surface to fit a fifteen-pound turkey. The ‘Flavorizer’ bars performed as described and provided flavorsome results, and the sear station was well received by most customers, who also commented on the convenience of the side burner in preparing non-grillable food items such as sauces, creamed corn, and chowders. The individually controlled burners were considered useful for cooking smaller quantities of food and that the even heat-distribution allowed for indirect cooking of some items. They were also considered useful for reducing the quantity of fuel used during cooking. Overall, it has been reported that the unit heats up amazingly quickly and the built-in temperature gauge allows people to accurately control their cooking temperature for top results. People have complained that the unit is prone to flare-ups unless cleaned regularly, and that rainwater readily gathers in the base of the firebox during periods of inclement weather. However, most customers were pleased with how easy the unit is to maintain.